Randy Newman may have had it wrong about short people (Cake Gumshoe Median height: 5'3") but he sure had it right about LA: We love it! Sure, the city is perhaps best known for its contributions to cinema, but it's also host to one of the most eclectic bakery scenes we've ever seen. From donut joints to panaderias to shops with daintily decorated cupcakes, this sprawling city has it all--and on our recent long weekend in the City of Angels, we set out to try as many spots as we could. Armed with suggestions from our friends Chris and Sandy, we headed off into the palm-tree lined sunset and set to our sweet sleuthing. Cakespy Note: With only 72 hours, clearly we weren't able to visit every sweet spot in the city--our short-people bodies can only stand so much--but please pass on any suggestions or spots we must hit next time! DAY 1: Our first stop, shortly after pulling out of the rental car lot, was the gorgeously iconic Randy's Donuts, which boasts a donut the size of a small house atop a takeaway stand on the side of the highway. Feel like it looks familiar? It's with good reason--check out here to see all the movies and films in which it's played a role. There we indulged in the unlikely but, as we learned, addiction-inducing, honey-wheat flavor combination on our donut (pictured top). So far, so good. Feeling the urge to eat something un-sweet for the moment, we headed over to Santa Monica, where we settled on Euphoria Loves Rawvolution, an eatery catering to the raw, vegan crowd--not a touch of the food had dairy or had ever been heated above 115 degrees. The food was good, although we must admit that there might be a learning curve to eating raw--the textures on some of the items were a bit dense and dry for our tastes. 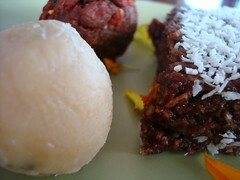 But all was forgiven when we got to dessert--a trio of (raw) dessert truffles, including a coconut fudge, goji berry, and cookie dough truffle, which were dense, rich, not too-sweet and made us very happy. Feeling virtuous and...yes, slightly euphoric, we headed back to dairytown--by way of Vanilla Bakeshop, where we tried out a vanilla bean cupcake--and really, perfection is the word that comes to mind. Across the street, Yummy Cupcakes was already closed, so we hit up Whole Foods, where we browsed wares from La Brea Bakery and others. We drifted over to the pier for some roller coasters and recognized the pier right away from Don't Tell Mom The Babysitter's Dead--heading back to the hotel, we drifted off to sweet dreams. DAY 2: The next day, we started out with LA's coffee chain, the Coffee Bean & Tea Leaf, where our Seattle coffee tastes were satisfied, if not wowed, by the coffee. 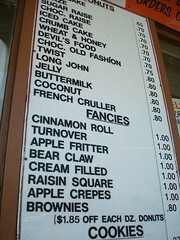 Breakfast was a delight at Jack N Jill's, a cafe which we loved if not completely agreeing with their typestyle choices. As a bonus to breakfast-eaters, an alluring counter display of cupcakes is right by the register--cos we understand that sometimes you need dessert, even after breakfast. That's when the day hit hyper-awesome mode, because that's the point at which we met up with the awesome Jen and Erica of All-Mighty, a company specializing in everything cute, and everything Boston Terrier. Our first stop was Auntie Em's, a cafe which was featured on Bobby Flay's Throwdown. 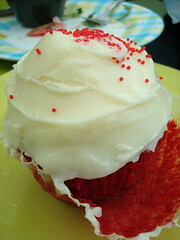 Apparently Bobby's cupcakes won, but you could have fooled us--the red velvet and carrot cake cupcakes we tried were simply superlative, and possibly as large as a baseball mitt. Of course the food wasn't bad either. Jen gave us a roundabout tour of her city, leading us by Eat My Cupcake in North Hollywood (alas, closed when we dropped by), and then to the very cool neighborhood of Silver Lake, where we hit up the Cheese Shop of Silver Lake (home of Cake Monkey's Frosting Sandwiches! ), refueled at Intelligentsia (great floors, great coffee, pastries from Delilah). (As a side note, we nearly died cooing over all of the cuteness and coolness that is present at Giant Robot, a gallery and store with plenty of cake and pastry-themed stickers, stationery items and tees--and, of course, lots of other cool stuff). We were too full at this point, but the cake offerings at Town & Country looked awfully good too. 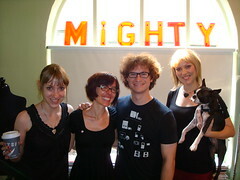 We also got to tour the All-Mighty offices, which are incredibly awesome--yup, these girls are a serious inspiration. By the time we left the offices, we cake gumshoes had found our appetites again, and so headed over to Crumbs Bakeshop in Beverly Hills, where we picked up the "Artie Lange", which we were informed by the friendly employees, is what the namesake eats every day for breakfast--four of them, that is. Artie has good taste, but he is also a very big man, and now we know why. DAY 3: We began our day by hitting up the OP Cafe in Santa Monica, a small and unlikely breakfast and lunch cafe perched across the street from a large office park. We were pleasantly surprised by their gorgeous array of baked goods: the cupcakes were delicately and daintily decorated, and were some of the prettiest we saw on the trip (photo above left). 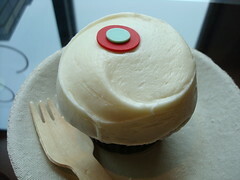 Heading back to Beverly Hills, we stopped at super-famous Sprinkles before getting our Rodeo Drive on. 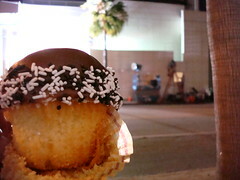 At $3.25 a pop for a simply frosted cupcake they're pricey--but then again, this is Beverly Hills. 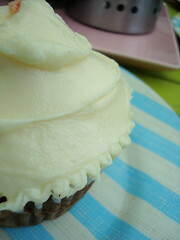 We tried a Chai Latte and a Red Velvet cupcake--and were not disappointed (photo above right). Hitting up Rodeo Drive, Head Spy Jessie thought it would be a great idea to be purchased a Tiffany & Co. Cupcake pendant as a present, but he didn't take the bait. Quel dommage! Next up was Joan's on Third, where we were hoping to find some celebrities along with our cake, but alas there was no Paris Hilton to be seen. However, the bakery department was worth the visit alone: majestic hi-hat cupcakes (above left), gorgeously decorated cakes, and decadent "Bouchon" bites--too good. 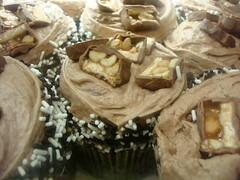 The bakery manager didn't much care for our taking photos, but we did it anyway when she turned to get our order. 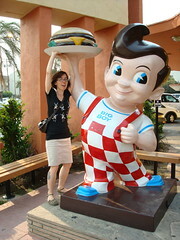 It was at this point that we reasoned that no trip to LA would be complete without a trip to Bob's Big Boy in Burbank--unfortunately, it turned out to be Bob's Big Disappointment--were we at the wrong spot for the huge Big Boy sculpture? This one wasn't that much bigger than a Cake Gumshoe. However, we did help him with his burger (above right). Next on our list had been Dots Cupcakes in Pasadena, but unfortunately time had gotten away from us and they were already closed. Luckily, we were able to drown our sorrows at Bob's Donut and Coffee before turning in for the night and our early flight back to Seattle. Just another perfect day...we love LA! All-Mighty (Not cake but just as sweet! ): Shop online at all-mighty.net. 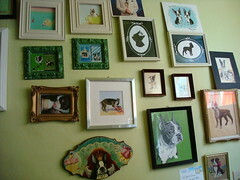 Auntie Em's Kitchen, 4616 Eagle Rock Blvd, Los Angeles, CA 90041, (323) 255-0800; online at auntieemskitchen.com‎. 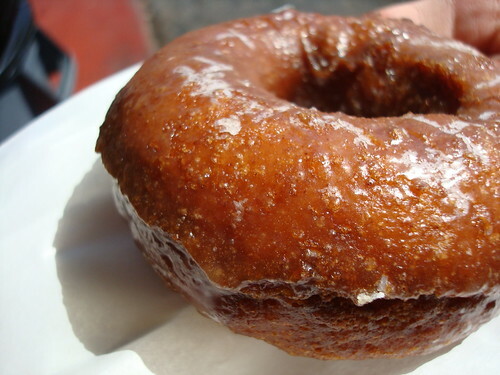 Bob's Coffee and Donut, 6333 W 3rd St # 450, Los Angeles, CA 90036; (323) 933-8929. Cake Monkey Bakery (Special order only) 877.640.CAKE (2253); online at cakemonkey.com. Cheese Store of Silver Lake‎, 3926 W Sunset Blvd, Los Angeles, CA 90029, (323) 644-7511; online at cheesestoresl.com‎. 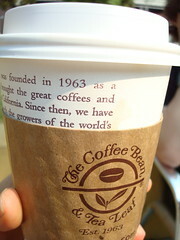 Coffee Bean & Tea Leaf, multiple locations; online at coffeebean.com. Crumbs Beverly Hills, 9465 Santa Monica Blvd., Beverly Hills CA, 90210, (310) 550-9811; online at crumbsbakeshop.com. 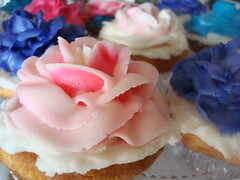 Delilah Bakery‎, 1665 Echo Park Ave, Los Angeles, CA 90026, (213) 975-9400; online at delilahbakery.com‎. 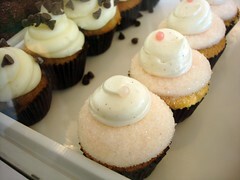 Dots Cupcakes‎, 400 S Arroyo Pkwy, Pasadena, CA 91105, (626) 568-3687; online at dotscupcakes.com‎. Eat My Cupcake, 5227 Lankershim Blvd, North Hollywood, CA 91601, (818) 509-2910; online at famouscupcakes.com‎. Intelligentsia Coffee & Tea‎, 3922 W Sunset Blvd, Los Angeles, CA 90029, (323) 663-6173; online at intelligentsiacoffee.com‎. Euphoria Loves Rawvolution, 2301 Main St., Santa Monica, CA 90495, (310) 392-9501; online at euphorialovesrawvolution.com. Giant Robot, 2015 Sawtelle Blvd, Los Angeles, CA 90025, (310) 478-1819; online at giantrobot.com‎. Joan's on Third, 8350 W 3rd St, Los Angeles, CA 90048, (323) 655-2285; online at joansonthird.com‎. 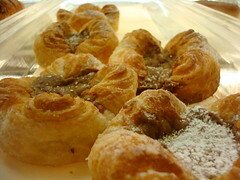 La Brea Bakery, 624 S La Brea Ave, Los Angeles, CA; (323) 939-6813‎. OP Cafe‎, 3117 Ocean Park Blvd, Santa Monica, CA 90405 (310) 452-5720; online at theopcafe.com‎. 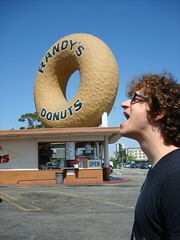 Randy's Donuts, 805 West Manchester Avenue, Inglewood CA 90301; 310.645.4707; online at randys-donuts.com. Sprinkles Cupcakes Inc‎, 9635 Santa Monica Blvd, Beverly Hills, CA 90210, (310) 274-8765; online at sprinklescupcakes.com. (323) 667-3331; online at towncountry.com‎. 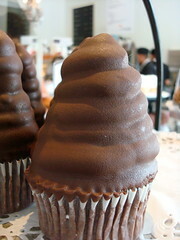 Vanilla Bakeshop, 512 Wilshire Blvd Santa Monica, CA 90401, (310) 458-6644; online at vanillabakeshop.com‎. 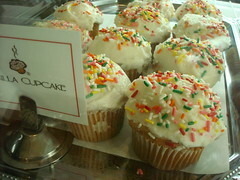 Yummy Cupcakes‎, 313 Wilshire Blvd, Santa Monica, CA; (310) 393-8283‎. Whole Foods Santa Monica, 2201 Wilshire Blvd, Santa Monica, CA - (310) 315-0662; online at wholefoods.com.